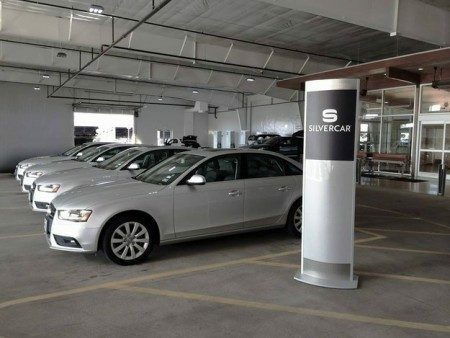 A little over a year ago, I wrote about a car rental service called Silvercar. I’ve wanted to try it ever since, and I had that chance while I was in Texas. The premise is brilliant: It’s a company that rents exactly one car, a silver Audi A4. $59 a day, streamlined check-in. As you’ll see below, it’s probably even better than I imagined. When I picked up my checked bags after arriving in Austin, I opened the Silvercar app, which instructed me to go to the passenger pickup area and then click a button. A few seconds later I got a text from Silvercar saying they were on the way to pick me up, and in less than a minute a driver was there. The Silvercar station was right across the street from the airport. The driver showed me how to scan a QR code on the car, and he walked me through some of the features of the car. It took about 3 minutes. Have you ever rented a car that quickly? I drive a 2003 Camry. This was a 2017 Audi A4. Let’s just say there were a few minor differences. I can’t even list all of the features in this car, so I’ll mention the most notable: I absolutely loved being about to plug in my iPhone and have it link to all sorts of functionalities, on a bigger screen on the dashboard. Maps, music, texting, calling…everything was there for me to use without ever looking at my phone. Really, I didn’t even need to look at the big screen because everything was voice controlled. Also, the car was simply a joy to drive. It’s fun to drive. I felt good simply being in the car. Which was really important, because I got lost. A lot. Austin has this weird highway system where far left lane is only for a U-turn and the next lane over is only for a sharp right. Also, there’s a lot of traffic in Austin, so one wrong turn can add significant time to a trip. Apple Maps also did something weird the first night on my way back to the hotel. I put in the hotel address, drove about 15 minutes, and arrived at the hotel. I was ready for bed at that point–it was close to midnight. But when I got to the front desk, they informed me I was at the wrong hotel. The address didn’t match the address Apple Maps took me to. So I tried again, this time entering the full address (including zip code). That worked. However, the incorrect address was stored in the car’s navigation system. The next day after I dropped off my parents at a different location, I selected the address and headed back to the hotel. 10 minutes later, I arrived for the second time at the wrong hotel. I got a good laugh at it. Anyway, back to the Audi. Other than being really fun to drive, it’s also really fun to tell everyone you’re driving an Audi, especially if you’re only paying $59/day for it. By the end of the weekend, I was ready to buy the car from Silvercar and just drive back to St. Louis with it, but I drive so little that it really doesn’t make sense to do something like that. But I was legitimately tempted. The story ends with me arriving with the car at the Silvercar station. No need to fill up on gas–Silvercar takes care of that for you for the same amount it would cost me to fill up (plus a $5 service fee). Then they drove me to the departure gate, and I was done. I haven’t rented many cars in my life, but this was by far the best rental experience I’ve ever had. I can’t recommend it enough. What’s the nicest car you’ve ever driven? What did you love about it? UPDATE: If you use the code BESTEVER, your first drive in a Silvercar will be $39/day. This entry was posted on Tuesday, October 25th, 2016 at 11:09 pm	and is filed under technology, their brilliant ideas and tagged with technology. You can follow any responses to this entry through the RSS 2.0 feed. Very impressive service – might try them myself sometime. I’ve used Hertz Gold where you walk up to the Car Rental Area, See your name on a board against a parking space, go to the space, get into the car – keys already in the ignition and drive to the barrier where you show your driving license and go. Nicest/Funnest car would have been a mustang convertible I rented many years ago (also in Austin funnily enough). Hertz Gold sounds great too! I love a streamlined checkout process. My next job I’m probably going to be flying around the country I will keep this in mind. It did remind me of a trip for an interview I recently took. I took a Lyft and had it go to the holiday inn at Fisherman’s wharf, we got there and I was like, this isn’t my hotel…. turns out it was a Holiday inn express, the Holiday Inn where I was staying was 2 blocks down the road. This sounds amazing! I’ve rented many cars and had some very quick exchanges with the rental car companies (you get the process down after a while when you travel for business), but I’ve never had such a full-service rental car experience. The little things like meeting you at the passenger pickup and dropping you at the gate are a nice touch. Yeah, everything about it felt like a luxury service at a consumer price. Haha! You went to the wrong hotel twice. I need a car like that. I get lost going to South County.